Mark and Justin are lugging the new StudioLive 32.4.2AI and the StudioLive AI PA speakers all over the country in the Thunder Roadshow tour. To check out the Thunder Roadshow in person, visit our Events page and learn when we’re coming to your town! Audio production doesn’t have to be complicated. That’s the notion behind both the AudioBox Studio package and this forthcoming webcast. Spend some quality one-on-one time with Justin Spence as he takes the mystery and frustration out of getting your first song recorded and mixed! 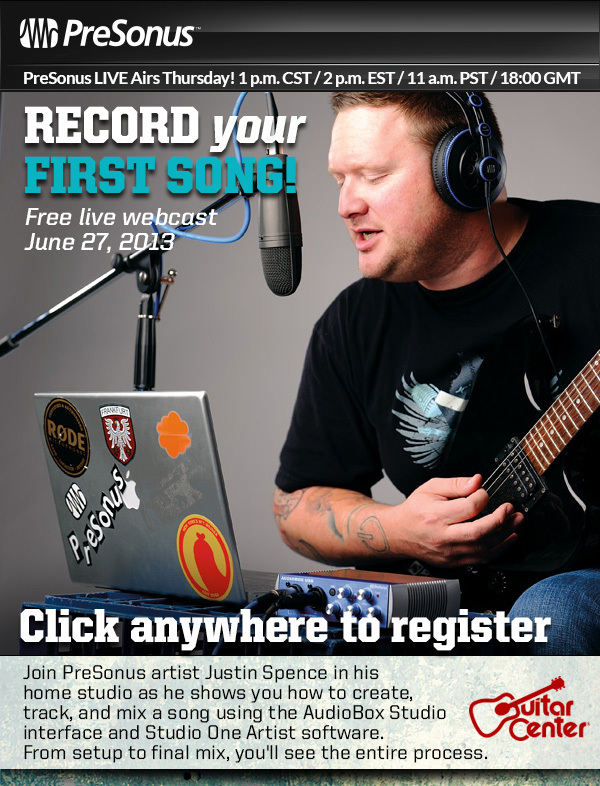 We’re hosting this show through a partnership with Guitar Center, so please note that you will need to click this link (or the image below) to register for this event, as it will not be broadcast from the typical PreSonus LIVE page. Come one, come all, come learn!